Miranda sipped her morning latte at Café Venetia on University Avenue. Eddie the street person came strolling by. He was about to explain how Palo Alto was like strawberries. Miranda offered to buy Eddie a coffee. “No thanks,” he said. “Not today. Today is a street planter day.” And Eddie sat down on the street planter a few feet away. Sometimes Eddie made a lot of sense to Miranda, and sometimes he didn’t. 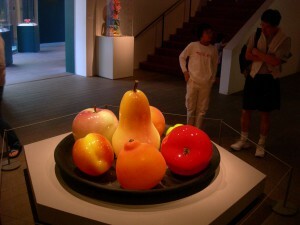 Fruit Still Life, by Flora Mace and Joey Kirkpatrick, at Stanford’s Cantor Art Center….